Clear Waves features two different Scan Modes: Spectrum Analysis and Monitored Frequencies. When set to Spectrum Analysis mode, Clear Waves scans the specified frequency range and displays a spectrum trace — that is, a chart with RF Signal Strength along the Y-axis and frequency along the X-axis. It also displays the data using a variety of diagnostic charts: Waterfall History, Density Chart, Delta Chart, and Intermods & Whitespace. The Intermods & Whitespace chart, in addition to displaying the RF spectrum trace, presents a visual representation of an intermodulation-compatible frequency set. Using the Monitored Frequencies scan mode, Clear Waves displays the RF energy detected at (up to) 160 specific frequencies defined by the user. For example, in the setting of a live performance where it is important to monitor the channels that have been assigned to wireless audio devices, the Monitored Frequencies feature can be used to ensure those channels are not being impacted by other sources of RF transmissions. 1) Before beginning the installation it will be necessary to download the latest version of Clear Waves. 4) Run the installation / setup program and follow the prompts for installing the application. Be sure to review the License Agreement as you progress through the installation procedure — each license key can be used to install the software on a single machine. When the Setup Wizard has completed then click the ‘Finish’ button. Please note that in addition to the application, the installation program should also install USB drivers from Silicon Labs (RF Explorer) or Zadig (RF Viewer). By default the application is installed in the folder ‘\Program Files (x86)\NutsAboutNets\ClearWaves’ and a desktop icon is created. 6) ClearWaves requires a license key (i.e. activation or registration code). The first time the application is launched you will be prompted to register the application. 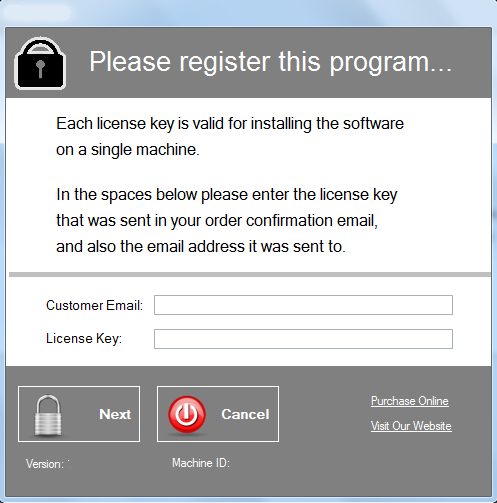 When the software was purchased you should have received an email with your license key. To register the program enter your email address (the one used when you purchased the software) and the license key you received by email. If you have not yet purchased a license key you can still evaluate the software by running in “demo” mode that uses simulated data. 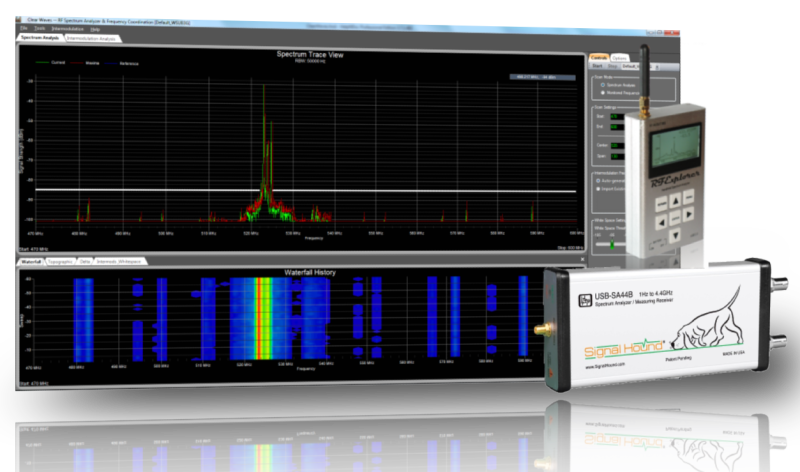 To run in “demo” mode launch the application without an RF Explorer or RF Viewer spectrum analyzer attached to your PC. The White Space Setting control is used to specify the threshold signal strength (in dBm) below which is considered ‘White Space’. When you adjust this control you’ll also see the horizontal, white line in the Spectrum Trace view move up and down accordingly. Along those frequency spans where the white line is solid and not interrupted by a peak, then this would be considered a White Space region. It is up to the user to determine what is an appropriate threshold for this control — it depends on the environment you are working in and what level of background RF energy you feel can be safely tolerated. As with most things, there are trade-offs. The lower (more strict) the threshold, the less white space and fewer intermod-compatible channel assignments available. The higher (more lenient) the threshold, the more white space and more intermod-compatible channel assignments will be available. When you right-click the mouse button inside the Intermods & Whitespace chart then a popup menu appears — selecting More Info… dispalys a box (similar to above) that lists all White Spaces and Channel Assignments (the Frequency Set) in table format. To save the frequency set to a file, from the main menu select File > Create Report…. This allows you to save the Frequency Set, list of white spaces, and current charts to a PDF file. Over time, the Density Chart will approximate the steady-state RF energy signature of the current environment, giving the user a better, more general idea of the environment. This is because the Topographic Map deemphasizes outliers such as intermittent or random signals while at the same time emphasizing signal transmissions that occur more frequently. Clear Waves allows you to generate a frequency set that takes into account interference from both RF interferers and intermodulation products. 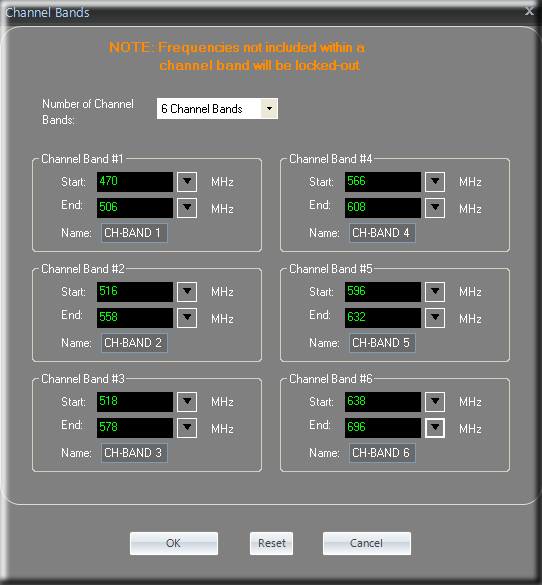 This is a very powerful feature — it allows you to make channel assignments using frequencies that are free of RF interference and intermodulation distortion. The results displayed in the ‘White Spaces and Intermod-Compatible Frequencies’ view are sufficient for most wireless audio installations. The frequency set that is computed in real-time is free of RF interference and the most destructive types of intermodulation distortion. However, for more demanding scenarios, it is possible to take the analysis a step further. 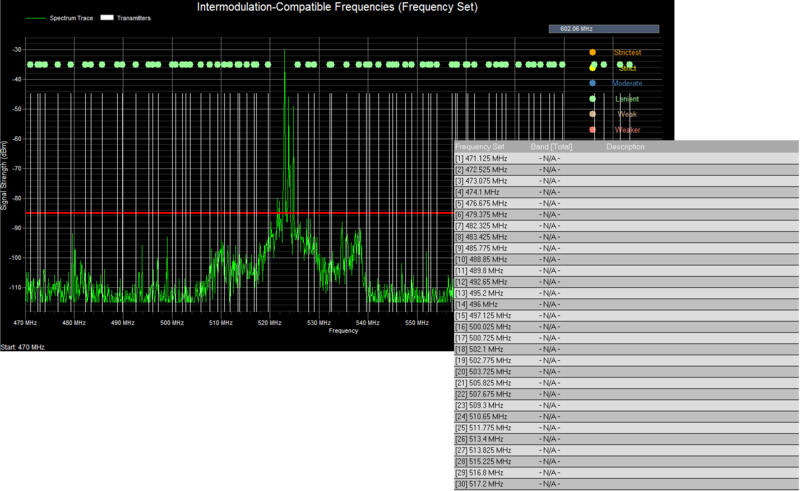 When you select the Intermodulation Analysis tab, a new screen is displayed with additional settings, grid and chart. [NOTE: While scanning is in progress then this feature is disabled]. Initially the chart is blank and you’ll need to fill it with a spectrum trace. 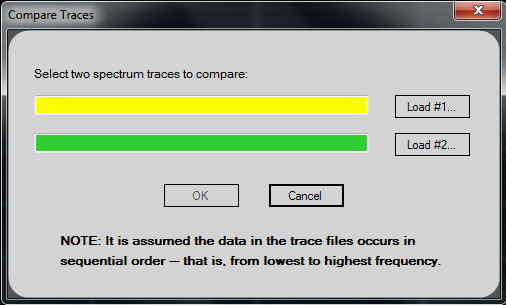 You can do this by pressing the Last Trace button, which will retrieve the last spectrum trace (assuming you had previously performed some scans). 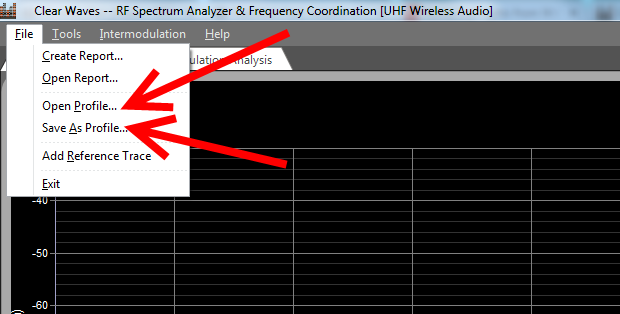 After the RF spectrum data is loaded then its trace will be displayed — along with a horizontal, red line that indicates the White Space Threshold. The White Space Threshold slider controls the threshold signal strength (in dBm) below which is considered ‘White Space’ — that is, frequencies not subject to RF interference and which should be considered potential candidates for the frequency set. As you adjust this control you’ll see the horizontal, red line move up and down accordingly. Those frequencies whose signal strength amplitudes exceed the threshold are considered off-limits and are locked-out — that is, they will not be considered as candidates for a frequency set. 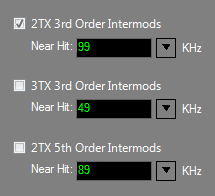 In addition to adjusting the White Space Threshold you should select a combination of intermod products you wish to test for from the Intermod Settings panel. The initial set of candidate frequencies from which intermod-compatible frequencies are drawn include multiples of the Step-Size that also fall within the “White Space” — i.e. below the White Space Threshold. After the White Space Threshold and Intermod Settings have been accounted for, press the Start button to begin the computation. 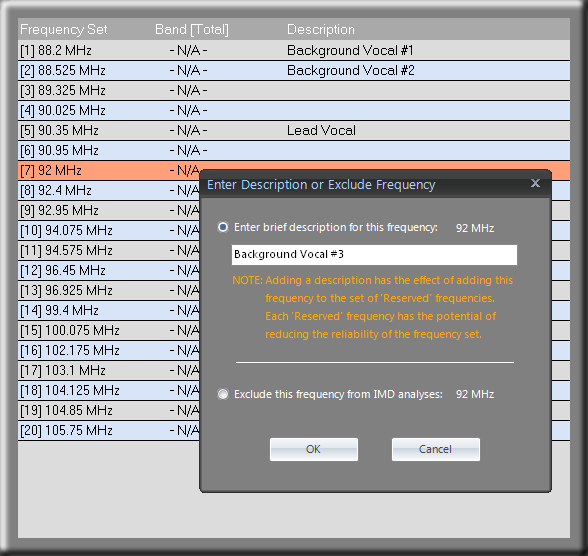 When the computation has completed the intermod-compatible frequencies that compose the frequency set are listed in the Results window. 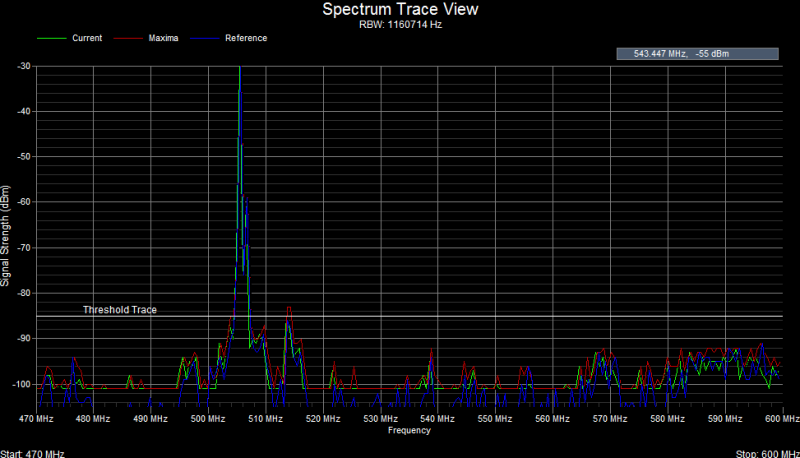 They are also displayed graphically on a spectrum trace chart, as shown above. Here you should see that the intermod-compatible frequencies (the vertical white lines) only occur within the ‘White Space’ regions. 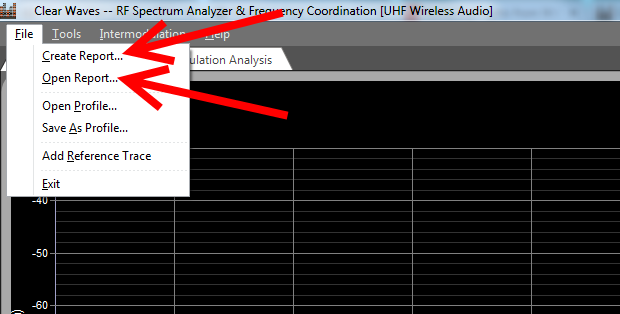 When the computation has completed the intermod-compatible frequencies that compose the frequency set are listed in the Results window. The Results window displays 3 columns. 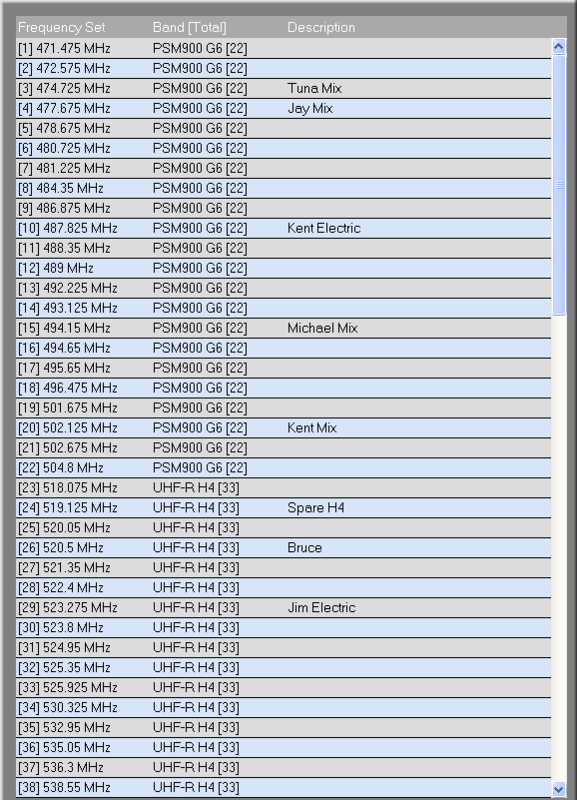 Under the first column is listed all the frequencies that belong to this frequency set. These frequencies are guaranteed to be intermod-compatible based on the stringency applied during the intermodulation analysis. If channel bands are being used, then the second column indicates which channel band a particular frequency belongs to. The number in brackets is the total number of frequencies (in this frequency set) that belong to a particular channel band. 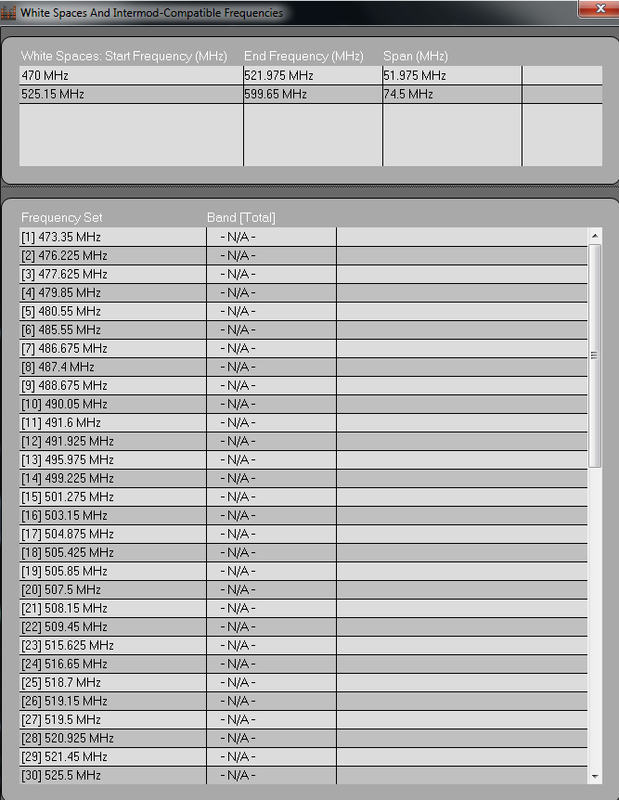 And the third column displays descriptions for those frequencies that have been designated as “reserved” and which will always be included in an intermodulation analysis. Clear Waves allows you to add a label or description to any frequency within the frequency set. When you left-click on a frequency in the results window then a DialogBox appears that allows you to enter some text. When you are finished then press the ‘OK’ button. If you choose to create a PDF report the description you just entered will also be included. 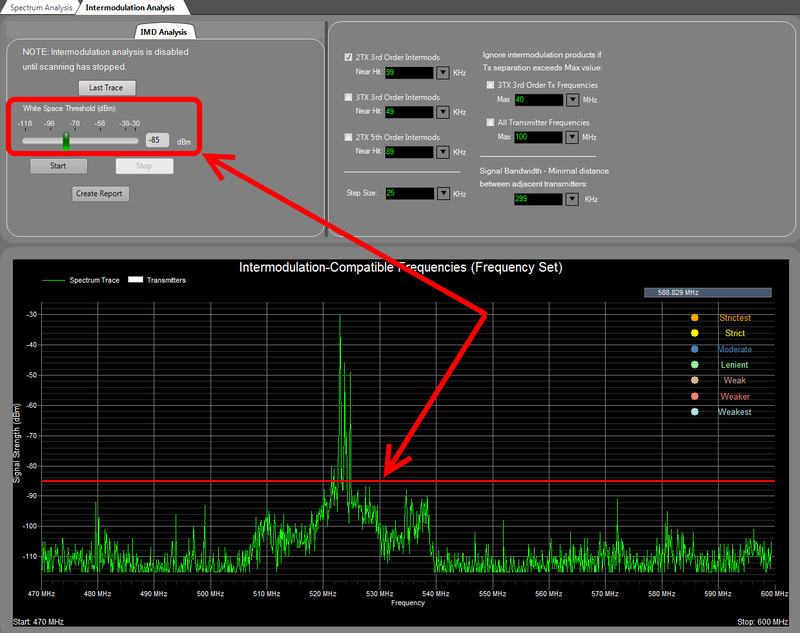 Alternatively, you can use this DialogBox to exclude a frequency from all future intermodulation analyses. Adding a description serves another important purpose — it designates that frequency as a “reserved” frequency. A reserved frequency is one that will always be included in the frequency set that results from an intermodulation analysis. Reserved frequencies provides a means for a user to enter one or more frequencies into the coordination for those instances where a particular device is considered mandatory. For example, facilities or events often have a pool of existing equipment to which channels will need to be added. Also guest systems using preconfigured channels may have to be integrated and coordinated with resident systems. 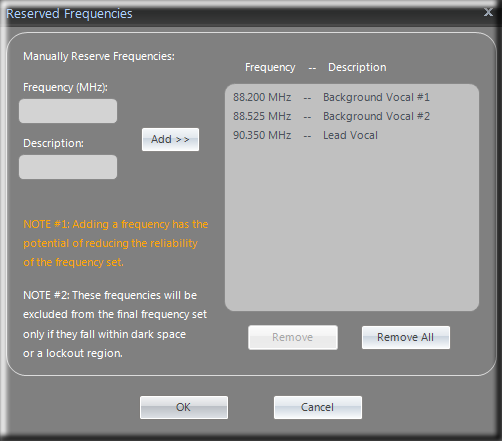 There are two ways to add Reserved frequencies — from the main menu select Intermodulation > Reserved Frequencies, or from the Results window left-click on a frequency and add a description (as explained above). When you use the latter method and then go to Intermodulation > Reserved Frequencies, you should see the frequencies have been added. To copy, cut or paste a description, select a frequency in the results window and right-click. If a description is ‘cut’, then the corresponding frequency will be removed from the reserved frequencies. Similarly, if a description is ‘pasted’, then the corresponding frequency will be added as a reserved frequency. Clear Waves’ lockout feature allows you to manually lockout frequency ranges of your choosing. Frequencies within the locked-out regions are removed from consideration as potential candidates for a frequency set. 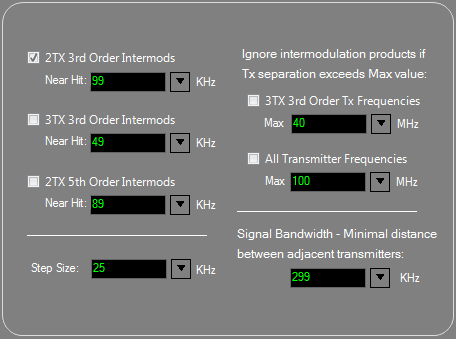 This feature is accessed from the main menu by selecting Intermodulation > Lockout Frequency Ranges. 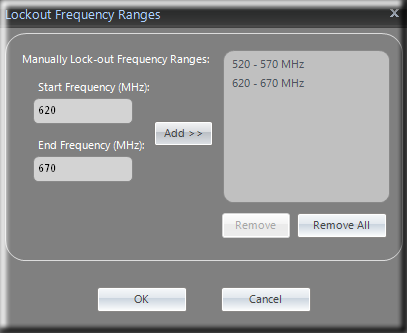 When the Lockout Frequency Ranges dialogbox appears enter Start and End frequencies, in MHz, and press the Add button. The frequency range you just entered will be added to a growing list of frequencies that will be excluded from the frequency set. The frequency set shown above was generated with two regions locked-out: 520 – 570 MHz and 620 – 670 MHz. 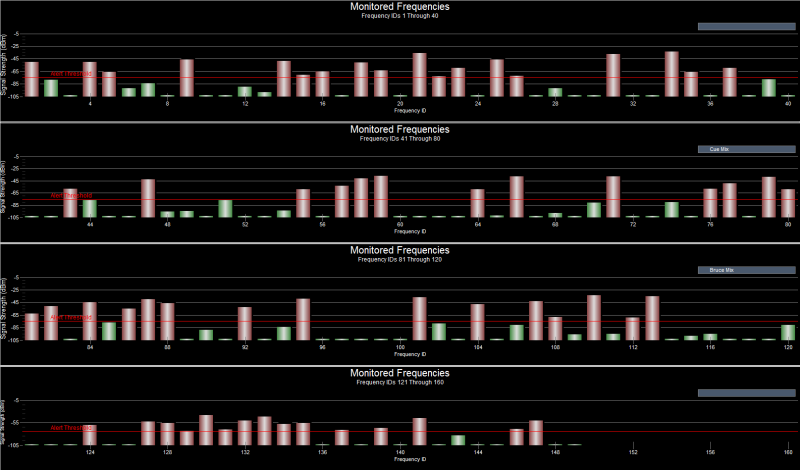 As you can see, the resultant frequency set does not include any frequencies from those regions. 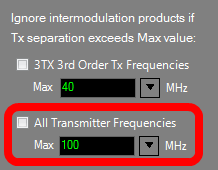 There are two ways to explicitly exclude a frequency from the frequency set and as a candidate frequency in future intermodulation calculations. One way is to select the frequency by left-clicking in the Results Window. 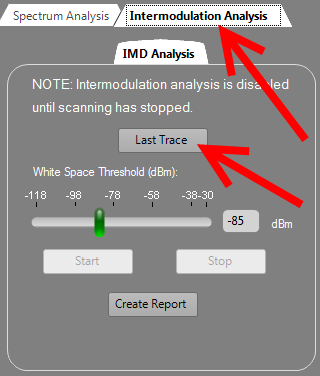 The dialog box that appears has an option to ‘Exclude this frequency from IMD analyses’ — select that option and press ‘OK’. 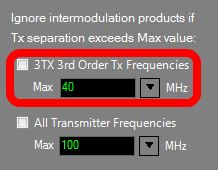 A second method is to select Intermodulation > Exclude Frequencies from the main menu. 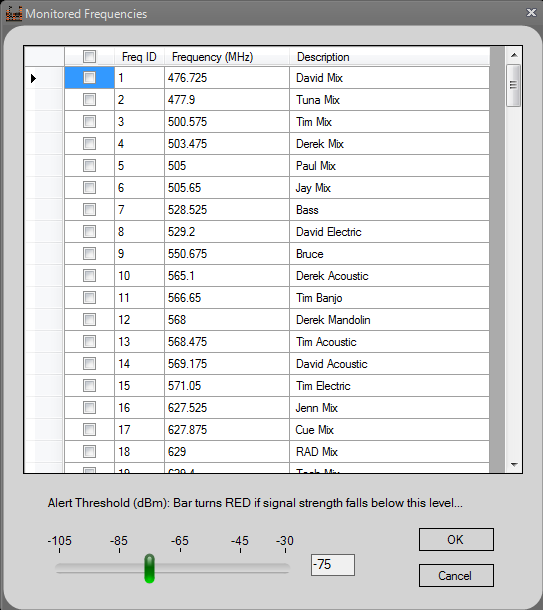 Clear Waves’ Channel Bands feature allows you to organize the frequencies within a frequency set into different groups based on their frequency ranges. 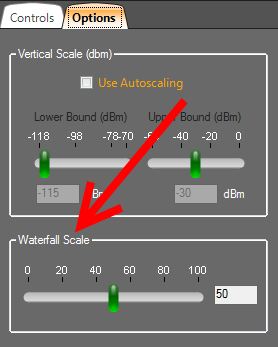 This feature is accessed from the main menu by selecting Intermodulation > Channel Bands. Often it is the case where audio engineers are working with a variety of different wireless audio equipment that operate in different frequency ranges. However, because the equipment operates within close geographical proximity then one frequency set is applied when configuring the frequency coordination and assigning channels to transmitters. In addition to setting the Start/End frequency for each band, you can also assign a short name or label. If you wish, channel bands may overlap one another — in which case certain frequencies may belong to more than one channel band. It is important to note that frequencies not included within a channel band will be locked-out of the intermodulation analysis. 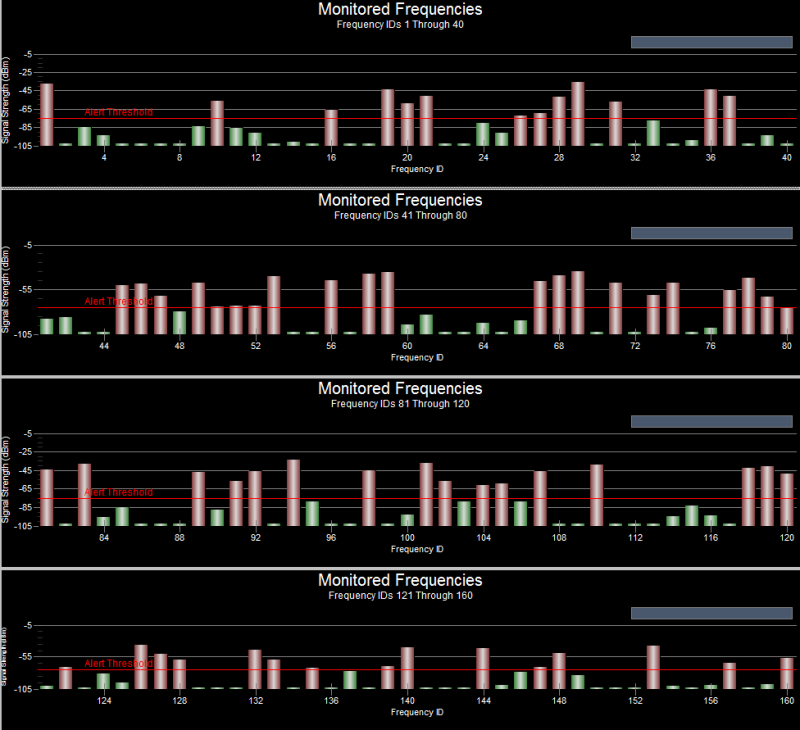 In the example above we’ve divided our frequency range (470 to 700 MHz) into 6 channel bands. 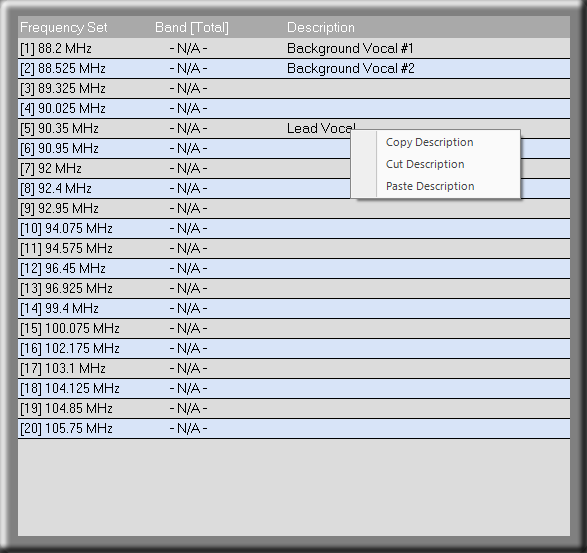 Under the ‘Band’ column is listed the channel band’s label that each frequency belongs to. 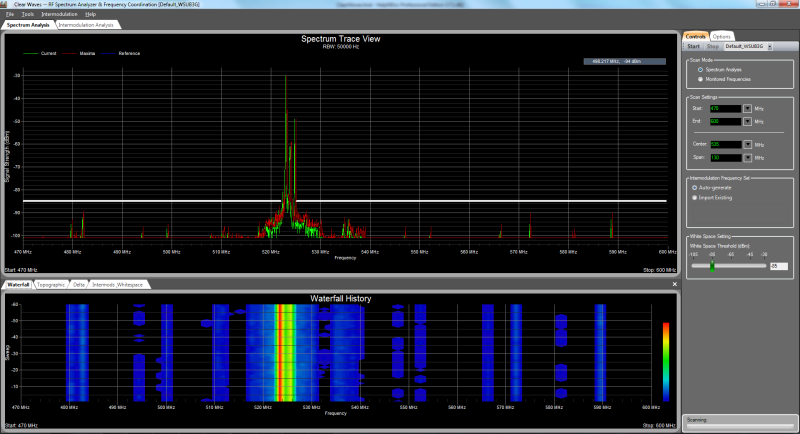 Also, the number in brackets is the total number of frequencies that fall within that channel band. As seen above, the frequency 533.375 MHz falls within two channel bands — “CH-BAND2” and “CH-BAND3”. “CH-BAND2” includes a total of 4 frequencies and “CH-BAND3” includes a total of 9 frequencies. Just to be clear, all channel bands (and frequencies) belong to the same frequency set — hence, frequencies in different channel bands are still intermod-compatible. 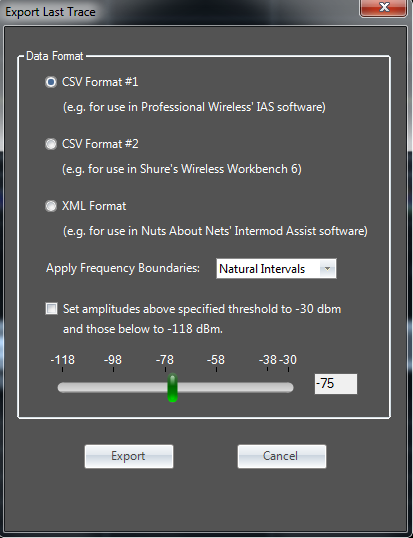 Clear Waves has the ability to export the frequency set data (i.e. the list of frequencies in the ‘Results’ window) in XML format that is recognized by both Clear Waves and Intermod Assist. This is useful if you wish to use the results as input data to another program, such as Intermod Assist, for the purpose of performing additional analyses. An exported frequency set can also be imported into Clear Waves and used as the frequency set that is applied during real-time intermodulation analysis. 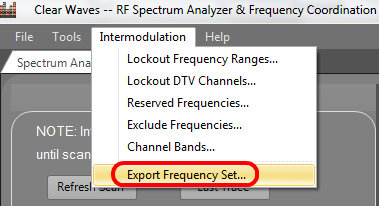 You can access the Export feature from the main menu by selecting Intermodulation > Export Frequency Set. 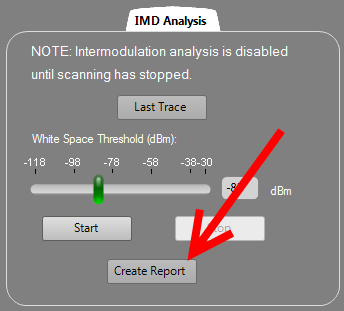 The Intermodulation Analysis view has its own report generation capability that is separate from the rest of the application and different than the one accessed from the main menu. Press the ‘Create Report’ button and you will be prompted for a folder and filename in which to the save a report file. An Adobe PDF-formatted file will be created that includes the graphical chart depicting the members of the frequency set, along with a listing of the frequencies and their labels (taken from the ‘Results’ window). At the same time, Adobe Reader will be launched so you can verify the contents of the report you’ve just created. Also, by selecting File > Open Report… from the main menu you can open and view Adobe PDF-formatted reports you’ve created (or any other PDF file). Clear Waves supports two types of profiles — pre-configured (or built-in) and user-defined. The difference is that user-defined profiles are created by you and stored as files that can later be loaded into the application. Profiles control many parameters, e.g. the Start and End frequencies. When you load a user-defined profile then these settings are immediately applied throughout the application and will be in effect the next time the Start scan button is pressed.